This article has new content coming soon from Halo: Silent Storm, and may not be complete, confirmed or correct. Please update it as soon as any relevant and accurate material is available. "We're not going to be your toys any more!" Chief Petty Officer Daisy-023 was a SPARTAN-II supersoldier of the UNSC Naval Special Warfare Command. Daisy was abducted and conscripted into the SPARTAN-II Program by Dr. Catherine Halsey in 2517 at the age of six. She was then taken to the planet Reach, and trained by the AI Déjà and Chief Petty Officer Franklin Mendez, along with the rest of the Spartan children. In 2525, she and the other candidates underwent a series of augmentations to improve their abilities. Daisy was among the ones who survived and were not crippled or killed by the procedure. A few weeks after the augmentations, Daisy and four other Spartans rebelled against their trainers, holding them at gunpoint in front of Dr. Halsey herself, in order to escape. Halsey granted them freedom, and they fled Reach as stowaways, hoping to return home to their parents. When Daisy arrived home at her home planet of Sargasso, the UNSC were already actively searching for her. She evaded patrols and found her home. There, she found a person nearly identical to herself, wheelchair-bound in her home's garden. Daisy was then approached by a Hornet VTOL with Dr. Halsey onboard. Halsey explained via COM that all the Spartans had been replaced by flash-clones when they were abducted, so as not to arouse suspicion of the missing children. Halsey urged Daisy to return to her and the rest of the Spartans. Daisy, shocked, drew her pistol and approached her clone. Her clone, confused and bewildered, stared at Daisy as she held her gun to her clone's face. After much hesitation, Daisy lowered her weapon, and began to leave. Her clone however, called after her, and offered her a small teddy bear on a chain, not knowing why she wanted to give it to Daisy, only thinking that she should do so. Daisy returned to UNSC custody and was transported back to Reach. However, her clone died soon after on Sargasso, as flash-clones did not live very long. Indeed, it was extremely unusual that this one had lived as long as it had. Daisy served as Gold Team's infiltration expert as of early 2526. On March 5 of that year, she and eleven other Spartans were organized into an assault squad assigned to board and capture a Covenant warship orbiting the planet Netherop. She and the rest of the squad were deployed from the prowler UNSC Starry Night for an EVA boarding action in order to accomplish this task. After the success of Operation: SILENT STORM, Daisy was reprimanded first by Sergeant Avery Johnson and then John-117 for acting as if the success of the operation meant the end of the war. At some point during the Human-Covenant War,[note 1] Daisy participated in a battle on a war-torn planet where she assisted several Marines pinned down by Covenant fire. She then assisted the Marines in getting to the evac point, where she met up with Ralph-103, a Spartan who had escaped with her in 2525, now as a serving Marine after his dismissal from the program. As their evac Pelican landed however, Daisy was impaled by Needler rounds. Ralph, who was now aboard the Pelican with the Marines, tried to help Daisy, but she told him to go. Daisy used her pistol to fire on a Covenant Sangheili, but the Pelican was destroyed by Fuel Rod Gun fire, killing all aboard. Daisy, wounded and helpless, died where she lay, unable to move. Her body was later found by John-117, who laid Daisy's teddy bear chain in her hands and closed her eyes. Daisy was voiced by Carli Mosier. A drawing of Daisy by Dr. Halsey, circa 2518. Daisy looking at Dr. Halsey. Daisy in a city on Reach. Daisy returns to her hometown on Sargasso. Daisy-023 in her MJOLNIR armor. Concept art of Daisy-023's armor. Concept art of Daisy-023's facial expressions. Concept art of Daisy-023's bear keychain. Concept art of Daisy-023's clone. Concept art of Daisy-023, Ralph-103, and one unnamed trainee. ↑ According to a series of "trading cards" posted on Facebook as part of a promotional campaign for Halo Legends, the battle in Homecoming takes place on Harvest. However, the same cards also erroneously claim Harvest is Daisy's homeworld, and have other mistakes, such as spelling Sergeant Hauser's name as "Howser". In addition, the planet is shown to have moons in Homecoming, whereas Harvest has no natural satellites. The site of the battle in the episode also has a number of visual allusions to Daisy's flashbacks of her homeworld, which could imply the scene takes place on Sargasso and would thus date the battle as late as 2546. This is supported by the opening narration, which states that the Outer Colonies are already gone at the time, implying the episode takes place after 2535. Whatever the case, Jeff Easterling has stated that 343 Industries have chosen to leave the setting vague for the time being. ↑ The appearance of Daisy's armor is the result of artistic license, save for its color, which is an approximation of camouflage for the environment in which she is fighting. 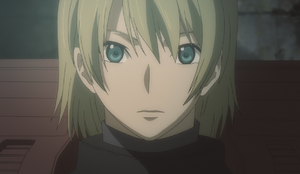 This decision was a concession to the anime studio to be able to employ a striking visual design for the character for the sake of visual variety, and, as Frank O'Connor states in the episode's commentary track, as a "nod" to multiplayer fans. ↑ Halo: Silent Storm, Chapter ? ?